Tour map is a great option you can use to add an additional dimension to your tour. It gives your viewers a better understanding of the space and distances and inspires them to explore. Tour map is available if at least one of your panoramas has a specified location. 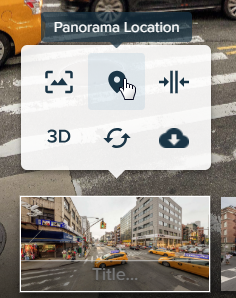 If you upload the image file which contains EXIF data with GPS coordinates, Roundme reads it and locates your panorama on the map automatically. If you would like to use your own map, you can upload it using Custom map tour upgrade.